(TibetanReview.net, Mar01’16) – As the 57th anniversary of the Tibetan National Uprising Day looms large, China has dispatched a high-ranking ‘special security delegation’ to Nepal to ensure there will be no Tibetan protests or related campaign activities. The delegation formally requested Nepal to remain on high alert throughout the month of March, reported telegraphnepal.com Feb 29. The report said the request was made at a meeting of Nepal-China Security Mechanism and Cooperation held at the Ministry of Foreign Affairs in Kathmandu. It added that those who attended the meeting included officials representing all the three security agencies of the country: Nepal Police Force, Armed Police Force and Nepal Army. Also reported to be present were representatives of Nepal’s Ministry of Foreign Affairs and Ministry of Home Affairs. 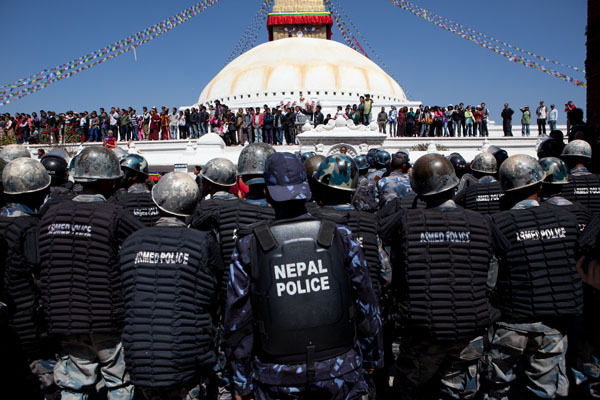 The Nepali side was reported to have assured the Chinese that they will do everything possible to contain anti-China activities in the country during and around the Tibetan National Uprising Day of Mar 10. The Chinese delegation was reported to have spent three days in Nepal, beginning Feb 27. The report did not name any member of the high-ranking Chinese security delegation.